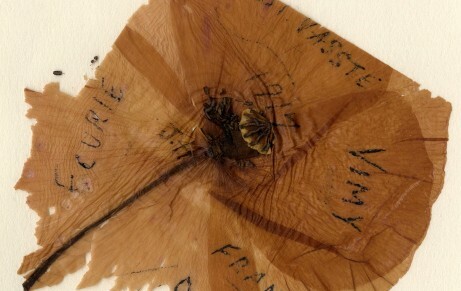 Two fragile pressed poppy flowers survive as a poignant reminder of John Harkess, a soldier from Washington in County Durham who served with the Leeds Pals in the First World War. 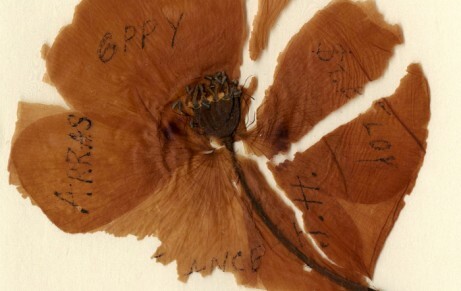 John carefully wrote the names of several places where he had served in France, and his initials, on the delicate petals before sending the poppies home to his wife Ann in 1917. 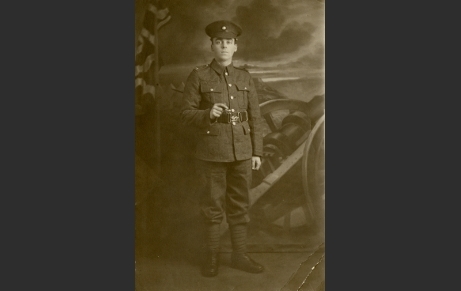 Arras, Oppy and St Eloy, France: J.H. Ecurie, St Vasste and Vimy, France: 1917, J.H. 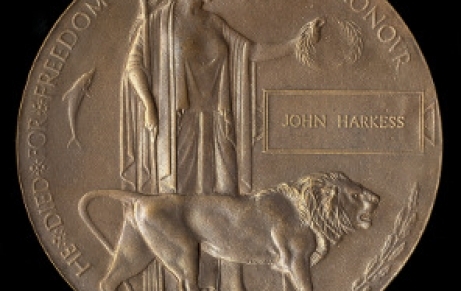 ‘As his name appears on the war memorial in Birtley, I presume that John Harkess originally came from there; however, on the marriage certificate his address is given as Usworth and on the wedding-cake card likewise: my guess is that, as they were both from working-class families, they didn’t start married life in a home of their own, but lived with parents – his mother, presumably, at first, then I’m guessing my great aunt went back to live with her parents as everything addressed to her was at the Wood Row, Washington, address. Presumably, also, they got married when he signed up as a soldier. 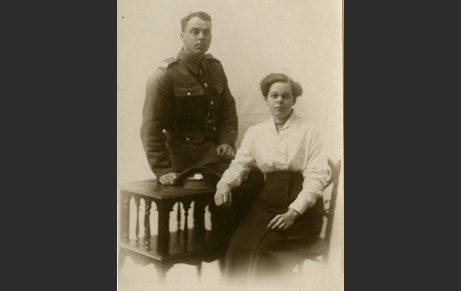 The two photographs already in the Archive look to have been taken at their wedding, judging from the way that her hair is arranged as compared with the photograph taken with John as a soldier, and her particularly attractive blouse. 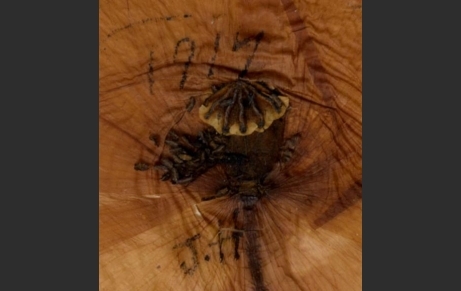 Certainly, she lived in Wood Row caring for her parents – both, and then her father when her mother died, until she married Thomas Burt about 20 years later. He was then retired (he had been Colliery Manager at F Pit in Washington, then Seaham) and widowed and lived in Low Fell. The houses in Wood Row were in a poor condition and, according to my mother, exactly like the colliery cottages at Beamish Museum. She got quite excited when we first saw them. I’m interested that the wedding was at the Wesleyan Methodist Church in Washington, as my mother, who lived with her grandparents in Wood Row for some time, spoke of them attending the Parish Church and the rector, Canon Lomax, visiting – apparently he rode a horse; also I remember going to church with my great aunt (we lived with her in Low Fell until I was about seven) at Lamesley Parish Church. Maybe she’d broken away from the Church of England to join a church with more young people, or perhaps the whole family were Methodist at one time, but I’m not convinced about that. She could have met John there, of course! 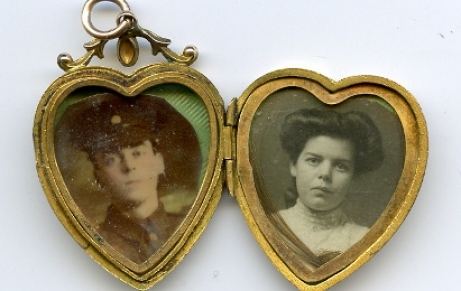 Also she had a brother, Tom, who was a Methodist Lay Preacher. 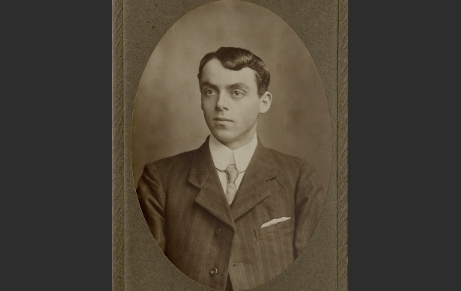 According to their marriage certificate on 24 June 1914, John Harkess was 26 years old, employed as a draper (Cooperative Stores) and living at 13 Havelock Terrace, Station Road, Usworth. 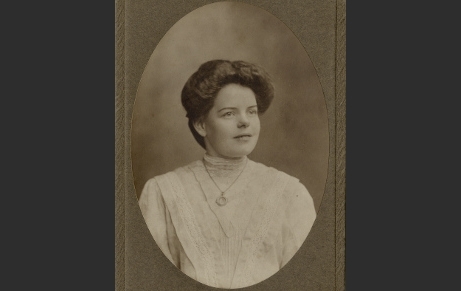 Ann Watson was aged 25 and living at 6 Wood Row, Washington. 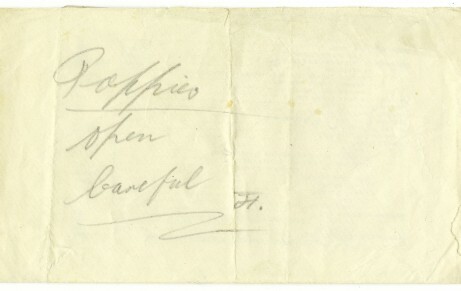 The address given on their wedding cake card was 7 Monument Terrace, Station Road, Washington. 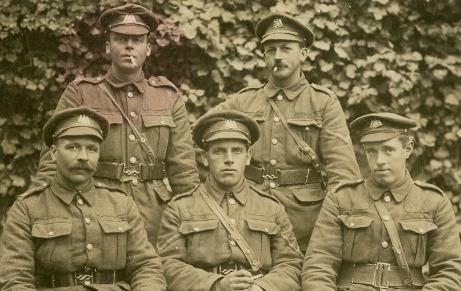 ‘Meanwhile the 15th/17th West Yorkshires (of the 31st Division) had been heavily engaged with the enemy. On the night of 25th March the battalion had withdrawn from its position near Judas Farm (near St. Leger) to the Boyelles-Ervillers road. On the 26th a further withdrawal took place to the Cemetery at Hamelincourt, though the position was swept by heavy artillery and machine-gunfire, causing many casualties. 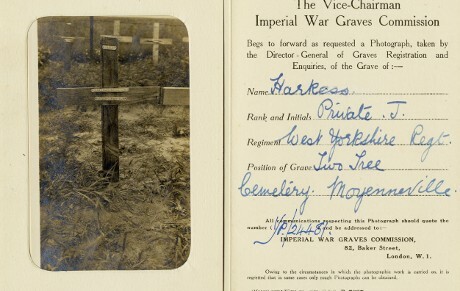 It is here that a very gallant action won for the 15th/17th Battalion the third Victoria Cross gained by the West Yorkshire Regiment in the War. 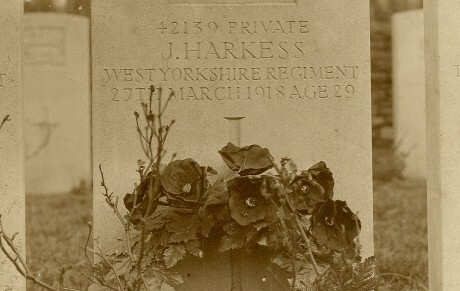 The National Probate Calendar describes John Harkess as being of 37 Morris Street, Birtley when administration was granted to his widow Ann on 12 August 1918.